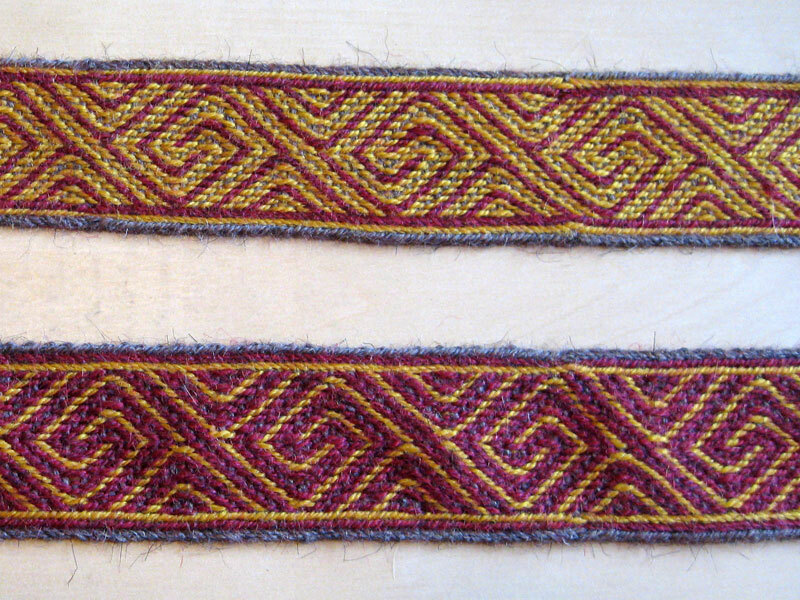 I’ve updated the blog with a new page: The tablet weaving experiment. It’s been quite a while since I started this project but I’ve been to lazy to publish any pictures or documentation. A couple of weeks ago I finally washed and ironed the ribbons and took some pictures – voila! One less UFO! 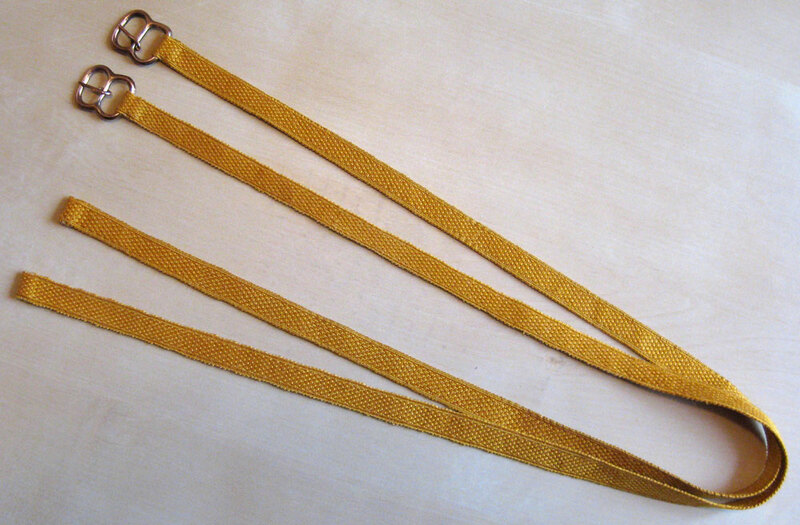 The first two ribbons woven with the empty hole technique in thin wool. Next I’m going to weave the pattern with silk thread. I have red and yellow but I’ll have to substitute the grey for white or some other appropriate colour. 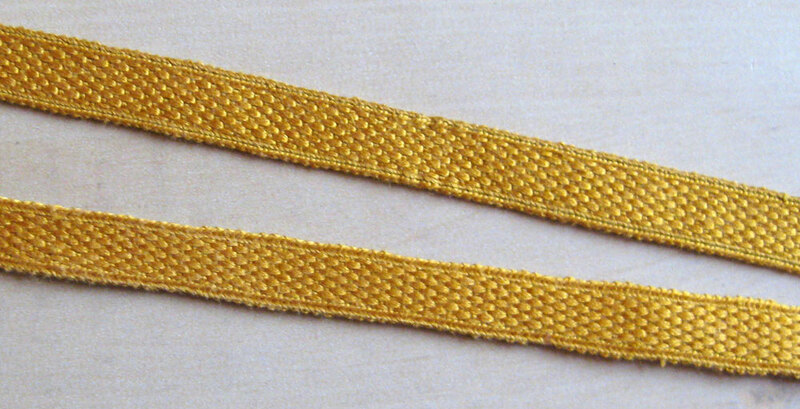 I’ve finally assembled the documentation for the silk garters with pictures and uploaded it on the weaving page (scroll down below the picture). Biorn wearing his new silk garters. I’m very pleased with the result. Biorn wore them at the University last weekend and they work well despite my consern for the lack of stretch in the weave. The checkered pattern of the tablet woven band. 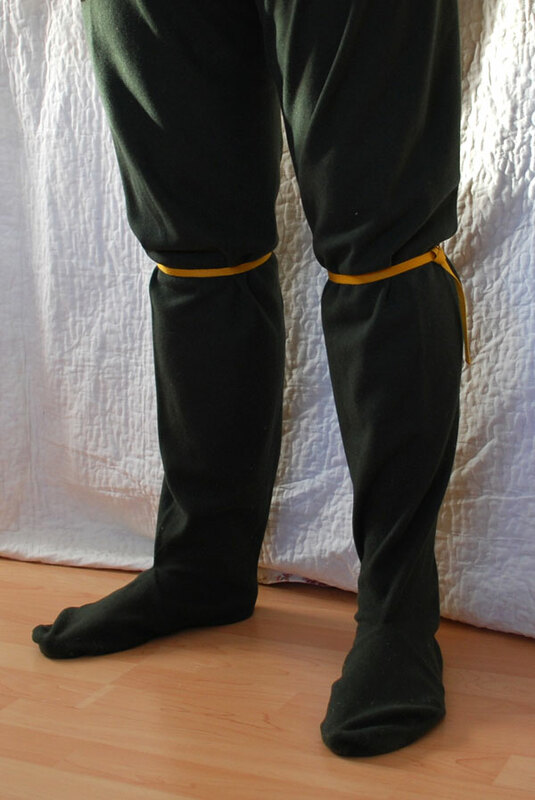 The length of the garters is 60 cm. It’s been a busy week so far with shire meeting and my mundane university class among other things. Now it’s finally time to write a few lines about the event. We arrived on site half an hour past midnight on slippery roads due to the snow falling on Gotland. The site was the local heritage center, and we got to sleep on the stage in the big hall (a bit weird but at least we didn’t disturb anyone arriving late). Saturday started out busy with the first class at 9. I talked about documentation in my class, how to write and why. I had about 8 participants so it turned out to be a really great discussion! Then I went to the next class at 10 to listen to Åsa Vävare talk about medieval fabrics – very interesting. I also went to Raighnils class about head wear, it was interesting but a bit short. 700 years of head wear fashion in 1 hour… I expected a workshop but it was more like a quick overview. Still they did a good job. After lunch and snacks we got to listen to a woman from Gotland University talk about her dissertation. It’s about how people (visiting Visby Medieval Week and the museum Jamtli) perceive history. Unfortunately her dissertation isn’t that good… it was a lot of “yep, I knew that” and definitely lacked that “this is the eye catching conclusion”. I also had some time to look at Åsas new loom. It’s a rigid heddle loom, very small and easy to transport. It looks like this: loom. We also talked a bit about her project on Birgittas coif. Very interesting – must start experimenting! At court I had the great privilege to announce the newest “guild mistress” (swedish: magister) in the Weavers Guild of Nordmark – Åsa Vävare! Yay for that! She’s a skilled weaver and it’s great that she’s willing to step forward and be recognized as one of the “I’m pretty confidant in my abilities – ask me and I shall help”-people. A bunch of other people got recognized with AoA:s, the Order of the Light (arts & science) and the Order of the Golden Ribbon (service). I got a Panache (kingdom A&S) which was especially honoring since the Queen herself had taken time time to make my scroll! The feast followed with lots of good food. The theme was a mix of pasta, meat and cheese – what’s not to love?! 🙂 It was fun to sit down and talk to all the people that you seldom meet but I was so tired that I went to bed early. It was a really nice event and I hope they will do it again next year! update the blog with my apron-project! Later today we are leaving for Nordmarks University, the first event since Civil War in October last year. Civil War always leaves you completely drained (that the downside to organizing events) but I’m finally excited about going to an event again – yay! This is the first year that the University isn’t organized by the Holmrike-crew, instead of Stockholm we are going to Visby. I’m looking forward to seeing how Styringheim has planned the event and I’m sure it will be excellent! I’ll be teaching a class, “How to write documentation”, and I’m hoping there will be some discussions – not just me talking the entire time. There are several other interesting classes and workshop that I plan to attend and I hope I’ll be returning home full of inspiration. I’ll return with a report sometime next week since I won’t be home until late Sunday evening.